Reduced to clear! BP-MB45R2CPF-CC5. 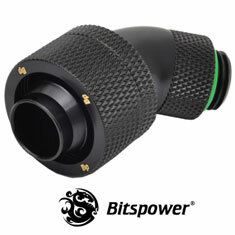 Bitspower G1/4 Matte Black Dual Rotary 45-Degree Compression Fitting for ID 1/2in OD 3/4in. Rotate, bend, and compress your liquid line all in one fitting with the dual rotary compression fitting series from Bitspower. This fitting combines the BP45-R fitting with Bitspower's CC5 compression, allowing for compression use on devices that have ports situated too closely to one another.